These days a lot of people are interested in DIY/Do It Yourself. Sometimes that interest turns into action and sometimes it’s a dream. Making something yourself or doing a job you’d normally pay someone else to do can be scary. Mark Frauenfelder was intrigued and fascinated by all the amazing creators he met as the editor of Make Magazine but he was afraid to tackle projects because he thought he didn’t have the right skills. But all the makers he talked to told him to just jump in. They hadn’t been experts in the areas they started tinkering in–they just learned as they went. So Mark spoke with what he calls Alpha Makers–the people forging their own paths, doing incredible things, and serving as inspiration to others–and started taking the leap himself. Eventually he had chickens, a chicken coop, bees, homemade food and drinks, and new confidence in his handy work. Along the way he learns about overcoming the fear of failure and embracing failing as an important learning experience. Mark’s job keeps him tied to a desk for most of the day and the time he spends building and making gives him much-needed time to think and a sense of accomplishment he’d been missing. He gets to spend more time with his young daughters in a more fulfilling way than just watching TV or everyone playing iPhone games. It’s not all joy and enrichment, though. Chickens get hurt, bees take over, and Mark’s wife complains that he spends too much time with projects and not enough with his family. He learns balance and compromise as much as any other skill. Anyone interested in DIY would learn from Made By Hand. It’s all the inspiration you need to try something new–be it building a cabinet, learning to draw, or making your own kimchi. Mark makes the case for DIY being more important now than ever and his failures and victories should give any wannabe maker the courage they need to get started. If you’ve been bitten by the DIY bug, check out Make Magazine or any of their collected editions (you can order a few through SWAN). 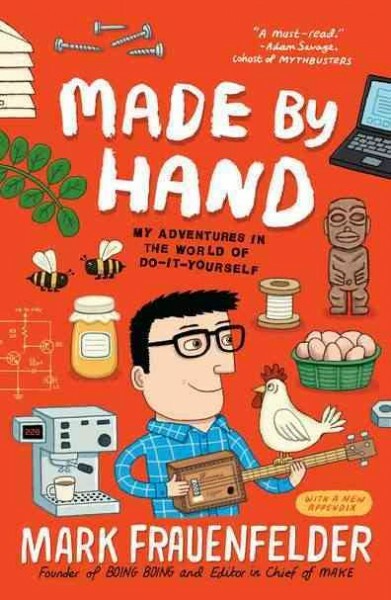 You can read more about Made by Hand, find an excerpt, and watch an interview with Mark on the Made by Hand site. Ready to get started? Mark’s cigar box guitar tutorial is free on the Make website.